No, given that you can see join date infer from there, and given that I want to prove a point. Textwalls are also very easy to see while skimming through threads. You accused me of trolling. Now youre accusing me of being previously banned. Youre grasping at straws. Can mods remove this meaningless discussion? Considering you have a cross IP with a banned account would explain it better. Now you have two banned accounts. PTURBG wrote: This is absolutely disgusting. Russia needs new frigates. India doesnt and shouldnt get them because its friendly with the US. India is friendly to India. And our interests mostly match closely to them, we have no rivalries over anything, and we have a history of co-operation and close ties. What's going to be on those Talwars that's going to be all that interesting to the US anyhow. Might as well export them and make some money. We can't induct them into our own fleet.. well we can, but they won't be much good without powerplants. BTW Cruiser Moskva will be modernized. Oh well would be great to have radars, avionics and P-500 replaced by Onyx. The Redut is a navalised S-350, it only uses the 9M96/E2 and 9M100. Original model Rif has a range of about 90km... the long range 9M96 has better range and performance... in fact late model BUKs have comparable range and better accuracy than the first model S-300s. The problem is that they were built for the Russian Navy to begin with so the Indians might want more foreign components added, but that would not be a huge issue. Selling them to India and starting all Russian component models would benefit the Russian Navy even if their will be a delay. Does it mean that Makarov tracked a Zumwalt destroyer near Syria ?? Traditionally those are marks for crew identification at least in western navies. Seems like a weird anachronism on a modern ship though. Apparently contract for 2* 11356 built in Russia for India has been signed, $950mil. Expecting a further contract for 2 to be built in India soon. Hole wrote: Is this Klingon? According to the source of our blog in the Russian shipbuilding industry, the contract signed with India for the construction of two frigates of project 11356 in October 2018 still provides for the completion of two unfinished frigates of this type for the Indian fleet at Yantar Shipyard in Kaliningrad. built for the Russian Navy - "Admiral Butakov" (serial number 01360) and "Admiral Istomin" (serial number 01361) - and not the construction of completely new ships, as we reported earlier. At the same time, according to the source, the actual cost of the contract for the completion of these two frigates for India is not $ 950 million, as reported by the Indian media, but $ 1.2 billion. The fate of the frigate Admiral Kornilov (serial number 01362), which was not completed on the Yantar PSZ, is still uncertain, however, we can assume that it will be used later on as part of the planned additional contract for the construction of two frigates of the project 11356 at the Indian state shipyard Goa Shipyard Limited (GSL) in Goa. Actually, from the very beginning of negotiations with India under an agreement on four frigates 11356, it was reported that the "localization" of the construction of two frigates in India involves towing and completing the construction of one unfinished hull in India and the construction of only one ship from scratch in India. Planned to be completed for India at Yantar PSZ, project 11356 frigates will be equipped with their own standard gas turbine main power plants M7H produced by the Nikolaev GP NPKG Zorya - Mashproekt (Ukraine) - with two sets originally built in Nikolaev for these frigates built for Russian Navy, but never sent to Russia due to the events of 2014. On August 17, 2017, the government procurement commission of the government of India approved the purchase from Ukraine of two specified sets of M7H gas turbine units for frigates of the project 11356 for $ 76 million. For the two frigates planned for construction in India, the Indian side will order additional sets of power plant on the GP NPKG "Zorya" - "Mashproekt". 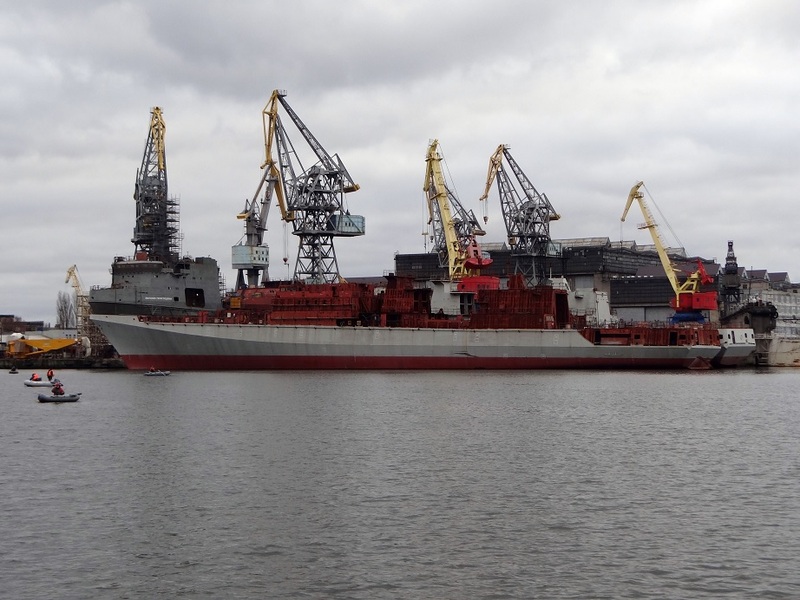 Recall that the construction of the second three ships of a modified project 11356 (of the type “Admiral Grigorovich"; sometimes designated as project 11356R or 11357) for the Russian Navy was conducted by the Yantar RPM in Kaliningrad under a contract with the Ministry of Defense of Russia No. З / 1/1/0553 / GK-11-DGOZ from September 13, 2011 worth 40 billion rubles. All six ships of the modified project 11356 were originally planned to replenish the Black Sea Fleet. i wonder, couldn't these frigates be completed for Russian Navy with Russian gas turbine engines? Only once engines/gearboxes are available. Engines are supposedly but rumor has it basically no work has been done on the gearboxes yet with Zvezda overloaded with work. Thing that doesn't make sense about such news is 404s have refused to supply engines/gearboxes for work to be done in Russia & the one thing thats certain about this whole shebang is the 404s won't have changed their minds about that. hoom wrote: Only once engines/gearboxes are available. I'm calling BS on that. No way they would develop a MGT and proceed with testing and certification and serial production unless they had parallel program for gearboxs. Oh there's a program but its Zvezda which has famously been very overloaded with orders for new gearboxes & M-507 engines. They haven't been idle, have put out gearboxes for 20385 & at least testing for 22350, I think stuff for Arktica icebreakers too? I think 11356 has just been down the priority list since its only for 3 ships. Personally I'd have given it high priority even ahead of work for 22350, not only to complete the BSF squadron but as I've previously suggested a 2nd 6* for Pacific/North. I mean back in 2014 when they first started setting up the domestic production & 22350 was still severely borked. Hopefully the money they make on the sale of these incomplete vessels could be invested in expanding production of the propulsion systems for new vessels. I also hope they can take this time to look at the designs and make any minor changes that might be wanted or needed so that the new vessels Russia gets are better fits for their needs. The parameters of the contracts are not specified, however, according to unofficial data, the amount of the contract for the supply of two ready-made ships is about 950 million dollars. Edit: just noticed the 'Federal Service' quote is at the bottom of the BMPD article above. "Work began at the plant that preceded the resumption of construction for the Indian Navy of two frigates of Project 11356. For this purpose, guard ship hulls that were built for the Black Sea Fleet will be used. These are frigates Admiral Butakov and Admiral Istomin, which are in varying degrees readiness "
I still wonder how they intend to get the engines off the 404s since 404s repeatedly refused to deliver if they are to be worked on by Russia. No, they refused to deliver engines for ships procured for the Russian Navy. Delivering engines for ships selling to 3rd countries is fine. Does any one know or confirm if the new VLS Shtil-1 with the new 9m317M/A has active radar homing ? Any more details or any links to it ?